« Are your meeting evaluations reliable? Ask meeting attendees what’s most important about the chairs they sit in at an event and they’ll inevitably say they should be comfortable. Ask meeting venues what’s most important about the seating they choose and they’ll probably say cost (though stackable and lightweight will be mentioned too). If you ask meeting designers like me…what would we say? This week I facilitated the world’s oldest peer conference: the four-day edACCESS annual conference that’s been running since 1992. The conference always includes a small tradeshow, and this year Steelcase was there. Steelcase is an interesting and unusual company. After a hundred years in business, it’s the world’s largest manufacturer of office furniture. Rather than resting on their laurels, the company’s management is continually looking for genuinely useful and innovative ways to improve business environments. As an illustration, take a look at the Steelcase blog which is written by top management rather than junior PR staff. 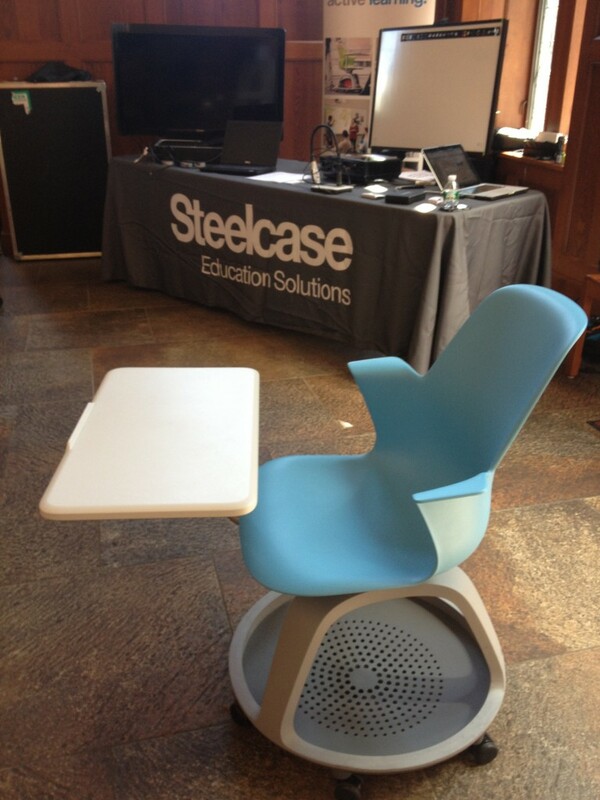 Steelcase wanted to show several lines of products designed for educational environments at edACCESS 2013. That’s where I discovered their Node chair, designed by IDEO and pictured above. I first noticed and liked the tripod storage platform under the chair—a great place to store bags and backpacks off the floor. But then I saw the chair had casters. And when I sat in it, I found out that the seat swiveled. “So what?” you may ask. Read on! Adjustable office chairs were invented in the 1850’s and became common in offices during the 1940’s. While office workers have long enjoyed the benefits of these chairs they are rarely seen in conference settings. A quick web search for meeting chairs turns up hundreds of images of rigid plastic stackable chairs that attendees have uncomfortably endured for years. Move between alternative seating formats. When you’re sitting in a traditional conference chair you face the front of the room and can only look elsewhere by turning your head and body as much as your chair allows. Looking anywhere but straight ahead becomes uncomfortable after a few minutes (see Paul Radde’s Seating Matters: State of the Art Seating Arrangements for more information on this). A swiveling chair like the Node makes such shifts of attention easy. A chair with casters allows participants to quickly move between seating sets. For example, a session might start with a ten-minute presentation, with chairs facing the presenter and then require small group discussions. Attendees can scoot their chairs into the right formation; no standing and lifting required. The Node makes this safe by having a tripod construction with a wide base of support, unlike standard office chairs that can tip fairly easily if moved too quickly. While the Node chair gives participants “room to move” it’s not perfect from a venue’s standpoint. There’s no way to stack Nodes, and their unit cost of $600+ will make most venues’ financial managers blanch. But this kind of seating is what we need if we’re going to transition at our events from the outdated lecture formats of the past to the interactive, engaging, connection-making, community building conferences of the future, and I salute Steelcase for having the vision and the commitment to improve seating options for the education and meetings markets. This entry was posted on Monday, June 24th, 2013 at 5:57 am	and is filed under Event design. You can follow any responses to this entry through the RSS 2.0 feed.You can leave a response, or trackback from your own site.